The BackWPup restore feature allows the simple restore of your WordPress backup in only a few steps. The restore functionality is only integrated into the BackWPup PRO version of our backup plugin. 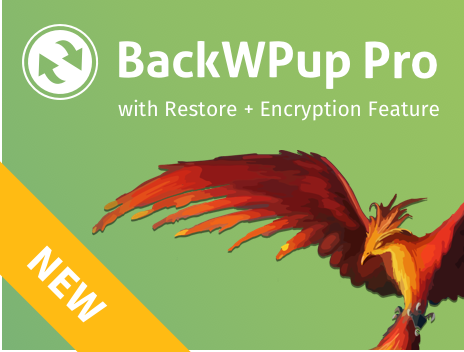 In this documentation we explain how you restore your WordPress backup with the BackWPup restore feature. Attention: Only backups made with BackWPup are restorable with the BackWPup restore feature. There are two different ways how to use the BackWPup restore feature. On the one hand you can go to the menu point Backup and then use the link Restore which is directly displayed below the backups. On the other hand you can upload and restore a backup by using the menu tab Restore. In this documentation we will present both ways. Moreover we will explain the functionality of a couple of useful files and directories. I have no access to my WordPress installation. Well, how shall I use the BackWPup restore feature? Go to BackWPup Pro → Restore. First, you need to upload the zip file of the backup you want to restore. You can either add it via drag & drop or use the button select archive. In case you don’t know where you can get the zip file from, read this documentation. Attention: Take care of the backup that you upload. The one you restore is going to overwrite your website. So, check out whether you uploaded the correct backup. Choose between a full restore and a database restore. Now you can choose whether you want to make a database restore or a full restore. When you decide to make a database restore, you are only going to restore the database dump. In case you decide to make a full restore, you are going to restore the whole installation with all files. In this documentaion we are going to make a full restore. Next, you need to find out and indicate some database settings so that a working connection to your database can be build up. You need to enter some database settings because BackWPup needs a working connection to your database in order to make a restore. Enter the Database Host, the Database Name, the Database User and the Database Password. You can find all relevant database connection settings in the wp-config.php. However, you can also ask your hoster. In this documentation we take the data from the wp-config.php. You find the file in the zip file of your backup. We also wrote a documentation about the wp-config.php. When you entered all data, click the button test connection. In case the test was successful, you get the information Connection to Database Successful. The plugin tested the database connection successfully. Now click the button Continue. You just reached the last step. When you want to restore your backup, click Start. BackWPup now restores your backup. This may take a few minutes in case you make a full backup. When the restore was successful, the information below is displayed. If BackWPup had any problems during the restore process, you can download the log file directly. There, the whole restore process is documented. So the troubleshooting is much easier. Besides to the described way you can also restore a backup directly. To do that, go to BackWPup Pro → Backups. There all your backups are listed. Choose the backup you want to restore and click the link restore. Choose the backup you want to restore directly. BackWPup now directs to the restore step we already described above as step 2. Choose whether you want to make a full restore or a database restore. Now we choose the database restore and click Database only. Click the button Database only to restore the database dump. BackWPup now directs to the step we already described above as step 3. 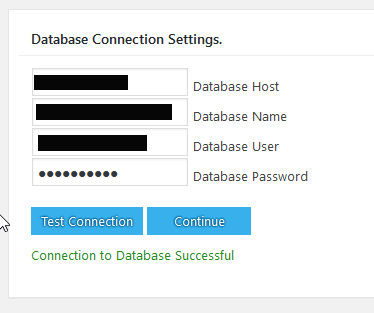 You need to enter the database settings to connect with your database. Test the connection. If the test was successful, click Continue. Now the BackWPup restore feature restores your database. In case you have no access at all, our BackWPup stand-alone app is your rescue. Check out this documentation to find out how you install and use this app. If the licence key is not activated after a restore or you have problems to activate it, please read the tutorial How do I activate my BackWPup Pro licence? All readers who are interested in technical things should read the following section. That’s because we want to explain what happens in the BackWPup’s background when restoring a backup. As soon as you call up the menu tab Restore, the plugin installs the directory wp-content/uploads/backwpup-restore on your server. This file is going to contain all information which are logged during the restore process. That’s the database import, the copied directories and some more information which are important for the debugging process. This log file is used to enable a fast support. Due to the file we can have a quick look at the restoring process. This file contains the restore process state as well as some information which are needed to know where the things shall be uncompressed, where the database dump is localized and so on. That’s a directory in which the archive upload is stored. You can find the directory here: wp-content/uploads/backwpup-restore/uploads. This directory is the place where the uploaded file is extracted. You can find the directory here: wp-content/uploads/backwpup-restore/extract. This file is used to prevent a direct access to the restore directory. That’s a file that prevents that the plugin makes a backup of the temporary restore directory. The wp-content/uploads/backwpup-restore is a temporary directory that includes the uploads as well as all extracted archives and all other files of which the user needn’t have a backup.